When I started to get into my art I was surprised by two things. First, that I didn't know what anything I made meant until it was done. I just get a picture of something that wants to come out, then towards the end of making it, it has relevance -- usually on several levels (I guess metaphor works that way!). Take "Mask for Baby." I just started playing with the clay one day, while I was talking with someone. I didn't set out on some massive mask-making project. Picked a convenient size, then realized that I wanted it to be functional. Okay, it's a mask for a baby then. It hit me like a ton of bricks! "What does that mean? Why is that concept tweeking me out? Why would a baby need a mask? They're pure and perfect and innocent. Well, so are we. But it's perfectly acceptable for us to wear masks ..." Mask for Baby. How does it make you feel? The parts and pieces of this were created spontaneously about two years ago and finally assembled, in its own time, a couple of months ago. 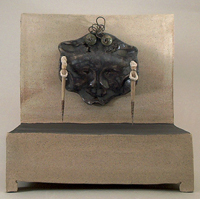 It sits in our co-op gallery, High Desert Living Arts [link]a few doors down from our pottery. The clay is doing us and we like it that way. The effect happens to be a manifestation of form -- pots and pieces that belong to people -- some we know, some we don't, yet. Our job is to get the pots to the people to whom they belong.